The GWLAB laboratory offers Diamond Grading services to the diamond industry and the general public. The grading is carried out according to GWLAB’s maticulate standards, methods and criteria. 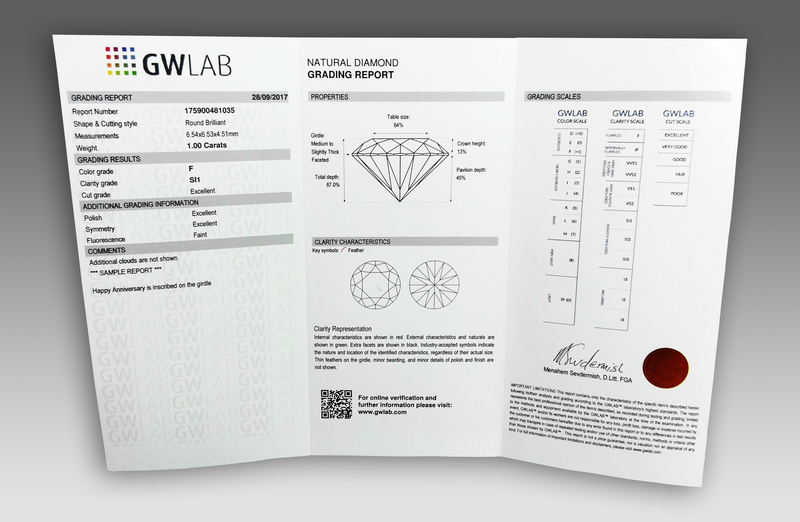 For colorless and near-colorless diamonds, the laboratory offers Full and Mini Diamond Grading reports verifiable online. 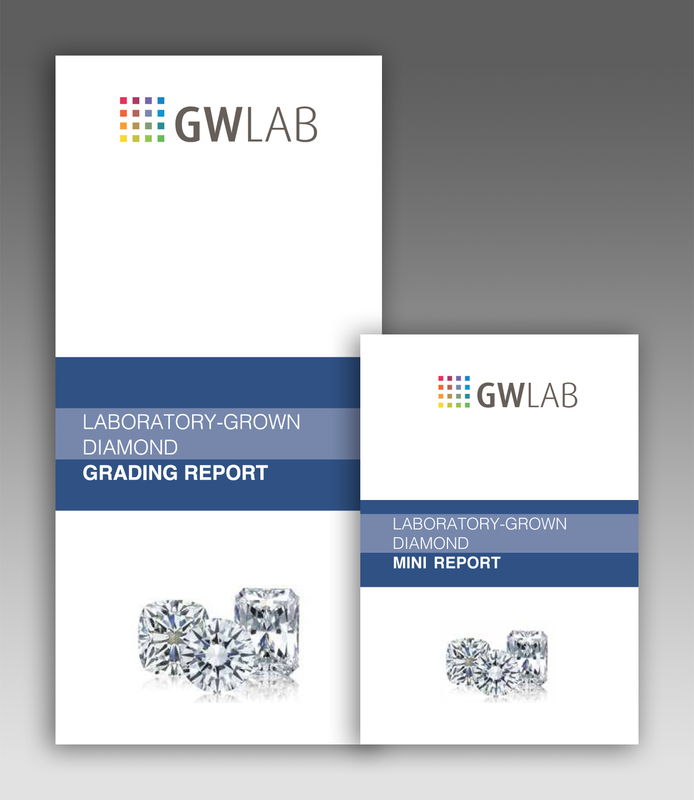 Each GWLAB Diamond Grading Report contains the diamond’s information, as graded by the laboratory’s gemologists. The information includes the stone’s report number, shape and cutting style, measurements (in mm), weight (in metric carats), cut grade, color grade, clarity grade, fluorescence, a proportions scheme diagram of the gem and a plotting diagram mapping the inclusions within the gem. 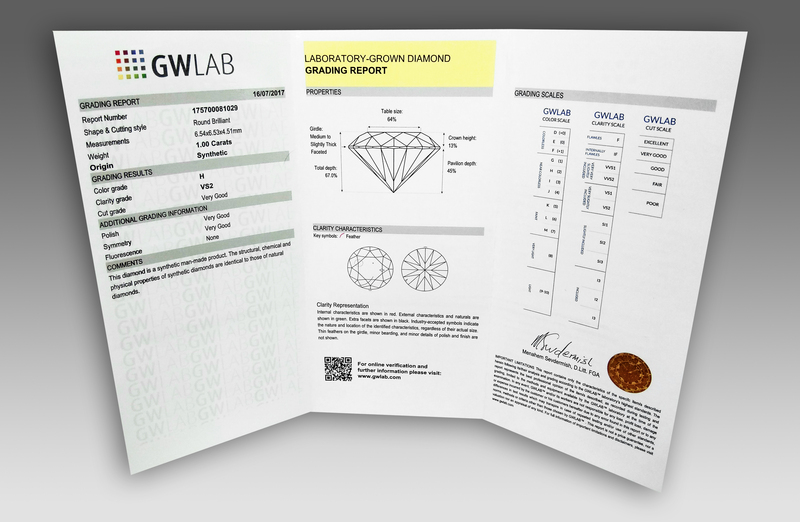 In addition, all diamonds received by the GWLAB laboratory for grading and were identified as of synthetic origin, and/or to have undergone color and/or clarity enhancements, are automatically labeled with a proper disclosure in the report. 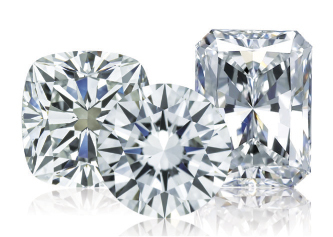 Thus our customers are always assured that all the necessary diamond’s information has been disclosed. To learn more about ordering GWLAB Diamond Grading Reports, please contact us.